Keep those sewing tools organized near your machine in real "Red Hat" style! Now the feet, threads, needles, scissors, bobbins and trims will not get away from you as you progress through stages of a project. 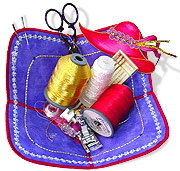 While hoop embroidery can be added to the fabric before making up the bowl, this useful tool gets its "pow!" from pressing, sewing, gluing and cutting readily available fabric and trims. 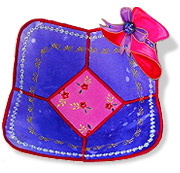 The bowl starts with a 7 1/2" square but you can make these in any size. Great, too, for stashing the needle you swapped but want to replace when the bowl is finished. Two main squares fabric, different prints 7 1/2"
Two squares for centers 2 1/2"
Fusible web to go under fabric pieces (Wonder Under, Steam A Seam 2 or similar weight which can be sewn through) Two - 7 1/2", Two - 2 1/2"
Step 1: Apply fusible web to back of large squares. Press one fusible web-backed piece of fabric to one side of stiff stabilizer. Press the other fusible web-backed piece to the other side. Apply fusible web to two smaller squares and trim edges. Step 2: Trim large "sandwich" to 7" square. Curve corners if desired, using spool base to shape. Step 3: Draw center line from top to bottom and side to side with chalk or washable pen on one side of 7" square. Step 4: Postion smaller square over the center and press in place. Outline with straight stitches using the Open Toe foot (SA147). Step 5: Turn "sandwich" over and position other contrasting fabric square within the outlined area. Press down. Turn bowl over and with Open Toe foot, anchor smaller squares with zigzag (satin) stitch. Step 7: Measure 1/2" in at top of each side of the lines drawn on the fabric. Narrow to just outside the area you satin stitched and cut a "V" on each side. Place your Open Toe foot at the center and slowly satin stitch over the cut edges as you pull them together. Stitch again at the wider setting you chose to use. (This shapes the bowl and the "V" can be different sizes to get other effects.) The sample used a solid poly (Brother 107) to cover the outer edge but variaged looks good, too. Step 8: Position the Open Toe foot so the zigzag covers the edge and interlocks to make a smooth finish. Stitch around the bowl. Trim any extra threads and stitch again at the wider width.